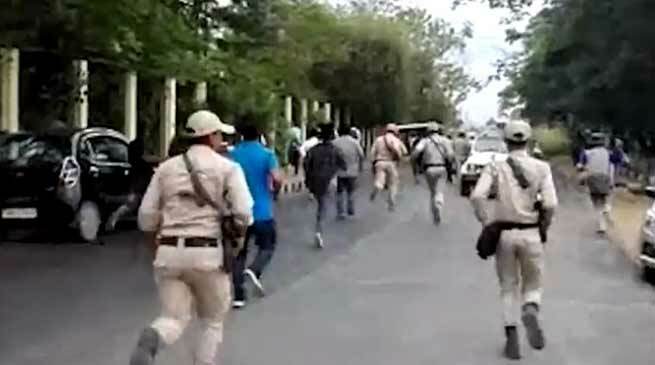 A fresh controversy erupted in the Manipur University on Wednesday as 17 students of the varsity were detained by police after conducting raids inside the campus, including boys’ hostel, following a confrontation with protestors. A large number of students staged a demonstration in front of the administrative block of the varsity, continuing their demand to unconditionally release the students and teachers who have been lodged in jail since the September 20 midnight raid inside the varsity campus. However, a confrontation broke out when police, guarding the block ever since pro vice-chancellor Prof. K Yugindro took charge, tried to disperse the student demonstrators. Police fired tear gas shells to disperse the demonstrators, however there was no report of any casualty. Later, additional police forces rushed at the scene and conducted raids inside the campus including the boys’ hostel and detained altogether 17 students. Meanhwile, the Manipur University Staff Association (MUSA) and Manipur University Teachers’ Association (MUTA) has strongly condemned the ‘brutal’ action of police on the democratically protesting students inside the campus. It urged the authorities concerned to work out an amicable solution for the present imbroglio in the university at the earliest.